Update 4/16/2009 - here is the recorded presentation. I will be making a presentation to the K2 User Group on Tuesday April 14th from 11am to 1pm central US time. Below is information for attending via LiveMeeting. presenting at our April K2 user group meeting. Jason will be demonstrating a K2 BlackPoint document management workflow with no code that contains InfoPath, site creation, permission management, topology management, site templates, content types, sharepoint integrated workflow for word documents, document metadata updating, emails, etc. Founded in 1998, MicroLink provides Business Intelligence, Information Discovery, Portals, and Collaboration solutions. MicroLink has a history of providing reliable, high quality, customer-driven solutions that focus on improving productivity, collaboration, and teamwork throughout our customers' enterprise. With a reputation for consistent, superior performance, and outstanding work in the public sector and commercial organizations MicroLink has earned the respect of its clients, partners, and employees. In recognition of this dedication, MicroLink has received the following awards; 2007 Autonomy Global Partner of the Year, 2008 Microsoft Federal Repeatable Solutions Award, 2007 Microsoft Federal Partner of the Year, and the 2007 and 2006 Microsoft DoD Partner of the Year, IBM Cognos client award for Excellence in the Public Sector 2008. 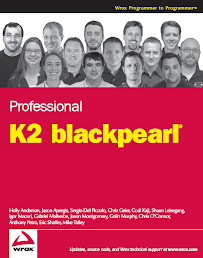 Jason Apergis is a coauthor on the recent WROX Professional K2 BlackPearl book that was released. He authored the chapter on InfoPath, SmartObjects and Deployments. Jason is also a K2 Insider. He currently works for MicroLink LLC as a Solution Architect focusing on MOSS and Business Process Automation solutions. Over the past four years Jason has done a lot of work with K2.net integrating it with BizTalk, SharePoint 2003/2007, InfoPath, ASP.net, SSIS, mainframes and other non-MS technologies. One of the solutions was nominated for a Microsoft Partner of the Year solution in 2006. Jason is a Virginia Tech alumni completing both his undergrad and masters in Information Technology. He plays ice hockey on a regular basis and is a huge Washington Capitals fan. We thank Jason Moseley from Hitachi Consulting for sponsoring our refreshments at our April meeting. Hitachi is a Microsoft Gold Certified Partner with a full range of business solutions and services for strategy and organization effectiveness, business intelligence and performance management, customer and channel (including CRM) and strategic technologies (including IT architecture and SOA). Hitachi Consulting is widely recognized leader in delivering practical, value-based business strategies and technology solutions. From business strategy development through application deployment, we are committed to helping clients quickly realize measurable business value and achieve sustainable ROI. They changed up their website a few months ago.